Diane Jones, left, and Mina Hampton, right, two mothers featured in the film, "The Mothers," receive applause after the screening in Phoenix. I recently traveled to Arizona to show my short documentary to parents and family members whose loved ones were murdered. About 350 people, including two of the Durham, N.C., mothers in my film, gathered in Phoenix Aug. 9-12 for the 26th annual Parents of Murdered Children national conference. “It shows the world that our loved ones will never be forgotten,” said Dan Levey, the organization’s executive director, as he stood before wood plaques, each bearing the names, dates of birth, and dates of death of several thousand murder victims. The plaques were unveiled to attendees on the first night of the conference during a ceremony facilitated by members of a police honor guard. My film, “The Mothers,” is a 10-minute documentary about a group of Durham, N.C., mothers who support each other through grief and healing after their child’s murder. It was shown Aug. 9 during the training workshop for leaders of Parents of Murdered Children support group chapters across the country. The reaction from the audience of about 100 was positive and affirming. “We have a story to be told,” said Levey, whose brother, Howard, was murdered in 1996. During a question-and-answer session after the film, audience members asked why I made the film. One individual said it was a “brave choice” to cover murder as a topic. I learned things, too. Some family members of homicide victims find the expression of sympathy, “I’m sorry for your loss,” almost offensive. One woman said friends and family of homicide victims don’t “lose” anyone. “They were ‘taken’ from us,” she said. The highlight moment for me came when two of the mothers featured in my film – Diane Jones and Mina Hampton, the co-leaders of the Durham, N.C., chapter – stood and received a round of applause from their chapter leader peers from across the country. Beckie Miller, the 2012 conference co-chair, led Part 1 of this workshop. 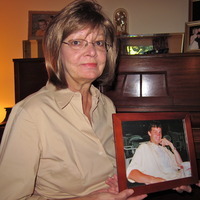 Her son, Brian, was robbed and shot to death in Phoenix in 1991. For nearly 20 years, she has led the Phoenix chapter of Parents of Murdered Children with 1,500 members. She said there’s never justice and the pain never ends. “It does get easier, but it’s never easy,” she said. She stressed the importance of coping skills like honoring a child by finding a cause and referenced John Walsh as an example. “There’s always something you can do to give yourself a way to endure,” Miller said. Dr. Joanne Cacciatore, a professor at Arizona State University who specializes in counseling those affected by traumatic losses like the death of a child, talked about the effects of traumatic experiences on the brain. She suggested working toward a “calm and centered” brain and offered ways to help repair damage from trauma by practicing yoga, meditating or performing service. “Any time you do something nice for someone else, you’re doing something nice for yourself,” she said. How does Cacciatore practice mindfulness? She hikes barefoot once or twice a week. In August, my short documentary film, The Mothers, will screen at the 26th annual Parents of Murdered Children national conference in Arizona. Parents of Murdered Children, a national support group for families and friends who’ve lost loved ones to violence, has chapters from New York to California. My documentary is about a group of Durham, North Carolina, mothers who support each other through grief and healing after losing a child to murder. On August 9 in Phoenix, The Mothers will be shown to 75 to 100 chapter contacts and leaders, including Diane Jones and Mina Hampton, two mothers in my film who lead the Durham chapter of Parents of Murdered Children. I talked last week with Beckie Miller, co-chair of this year’s national conference. She expects 300 people to attend the overall conference, which features keynote speakers and workshops covering grief, unsolved homicides, victims’ rights, the aftermath of murder and more. Miller’s 18-year-old son, Brian, was robbed and shot to death in Phoenix in 1991. For nearly 20 years, she has led the Phoenix chapter of Parents of Murdered Children with 1,500 members. The national conference, Miller said, is a time for survivors to connect, learn and feel inspired. “It just reminds us that we’re not alone and gives us hope that we can survive,” she said. I’m grateful for this opportunity to share The Mothers at the conference. I hope to contribute to a larger conversation, one I’d like to expand through other screenings in the city of Durham, which had 27 murders in 2011. I first screened this film to an overflow audience on May 18, 2012, at The Nasher Museum of Art in Durham. My film was among other short work screened by continuing education students receiving the Certificate in Documentary Arts from the Center for Documentary Studies at Duke University. That night was one of the best evenings of my life. Leanora Minai, left, shares a moment with Diane Jones, right, after the May 18 premiere of The Mothers at The Nasher Museum of Art in Durham. Jones is one of the mothers featured in the film. The mothers in my film – their strength and courage to survive and help others – inspired me to tell this story. In my years as a daily newspaper reporter, I wrote about many murders, but it was rare to have the chance to follow up on the pain that endures for loved ones long after the headlines disappear. I am forever grateful to Diane Jones, Mina Hampton and other family members in Durham for letting me into their lives and sharing their stories. To arrange a screening of The Mothers for your group or community, please get in touch with me. I also welcome any feedback about the film, as I consider the possibility of expanding it into a longer piece. You can post feedback or read comments left by others in the guestbook. Shakanah’s mother, Demetriss China, placed a red rose at the grave. Photo by Leanora Minai.On what would have been Shakanah China’s 14th birthday, her mother, family and friends gathered at her unmarked grave. Her mentor, Shanna Jefferson, stood by the gravesite with tears in her eyes and reflected on Shakanah’s birthday last year, the one they celebrated over a meal at Ruby Tuesday. “I never would have thought that it would have been the last birthday we spent together,” said Jefferson, who saved the receipt from Ruby Tuesday as a keepsake. Nearly a year has passed since Shakanah died in a drive-by shooting in Durham. 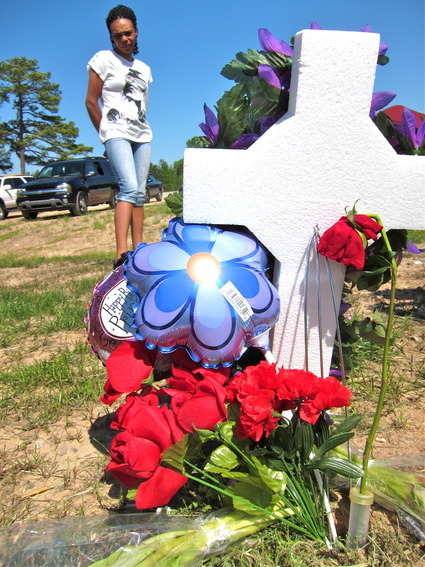 An unintended target, she was standing outside May 10, 2011, when someone opened fire from a passing van. Police say the murder investigation is active, but the case remains unsolved. “Some people say it was gang bangin’ … I don't care what it was over,” said Shakanah's mother, Demetriss China. Here are moments captured from Shakanah’s gravesite at Glenview Cemetery in Durham on Monday, April 9. Photo by Leanora Minai.Shakanah China’s grave at Glenview Cemetery. She is buried beside her grandmother. Anyone with information about the Shakanah China case is asked to call Durham Police Investigator Pate at (919) 560-4440 ext. 29332 or CrimeStoppers at (919) 683-1200. CrimeStoppers pays cash rewards for information leading to arrests in felony cases. Callers do not have to identify themselves. 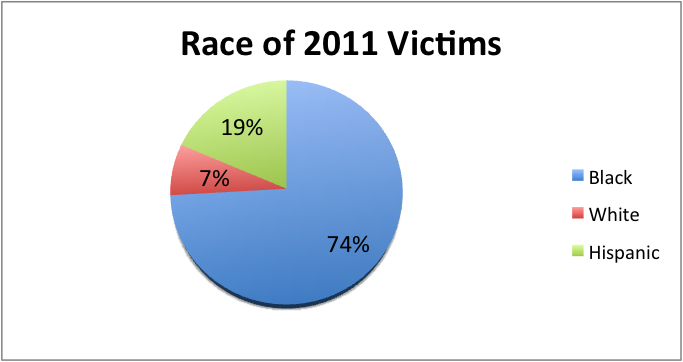 Twenty seven people were murdered in Durham in 2011. A firearm was used in 22 – or 81 percent – of the killings. It was also a year marked by a 3 percent increase in violent crime in Durham when, according to preliminary FBI semiannual statistics for 2011, the number of reported violent crimes in the U.S. was declining. 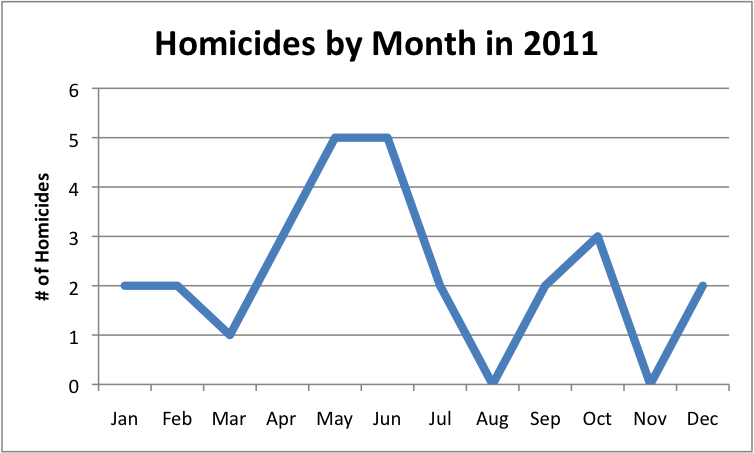 And within the first eight days of 2012, three people were fatally shot in Durham. "This is a very disturbing trend that we, as a community, should not and cannot accept,” Mayor Bill Bell said during a press conference Friday. Flanked by Durham Police Chief Jose Lopez and about 15 city and county officials in the Durham County Administration Building, Bell announced strategies to reduce gun violence in Durham. They include, among other steps, hefty bails and working to change legislation to ratchet up penalties for gun crimes. As part of my short documentary film, I’ve been reviewing data related to Durham homicides. Going into 2011, the three-year (2008-2010) average for homicides was 23. 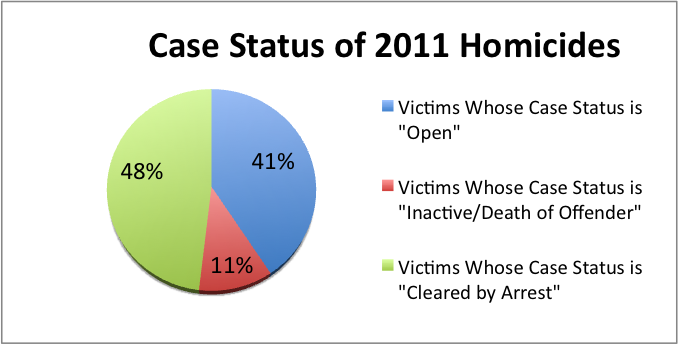 Of the 27 homicides in 2011, 11 victims' cases remain open and 13 have been cleared by arrest. 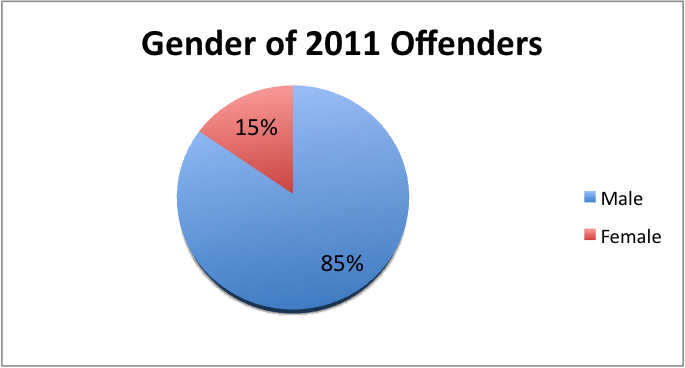 Three victims' cases are classified as inactive or not active due to the death of the offender. I’ve compiled a year-in-review snapshot, which I offer to raise awareness with the hope that it will spark meaningful conversations (even just one) about what can be done to address and mitigate gun violence. With 27 people killed, hundreds of friends and family members are forever changed by the loss. 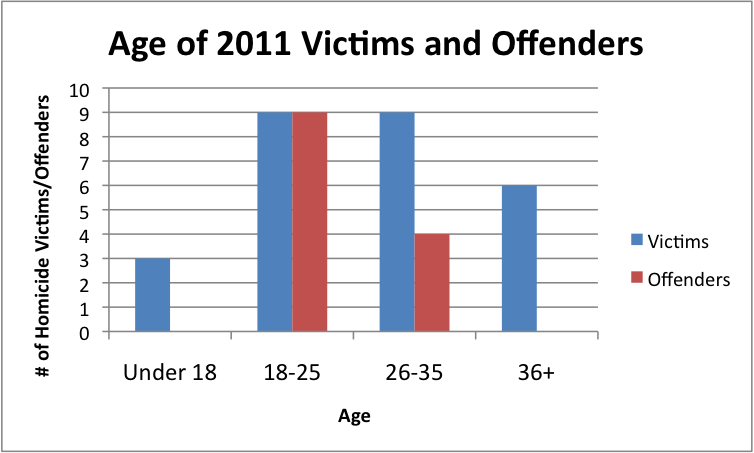 The following charts and analysis of Durham homicides in 2011 were created by leanoraminai.com using data from the Durham Police Department and other reports. Anyone with information about the unsolved homicide cases from 2011, or other violent crimes, is asked to call Durham CrimeStoppers at (919) 683-1200. CrimeStoppers offers anonymity and cash rewards for information leading to the arrest and indictment of felony crime offenders. 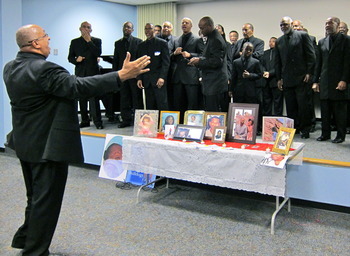 Marlon E. West directs the 100 Men In Black Male Chorus on Dec. 13. Photo by Leanora Minai.As I’ve learned from parents who’ve lost children to homicide, there’s never really any closure, and the holidays can be especially difficult without others who understand the grief. Last week, a local chapter of the support group, Parents of Murdered Children, hosted a remembrance dinner to support and comfort families coping with loss. Many brought photographs of loved ones lost to homicide, placing them on a table at the front of a room inside the main Durham County Library. There was the picture of Luciano Alejandro Cabrera, 21, killed earlier this year. In a framed photo near his, Willis Yates, 33, smiledwith his daughter. He was shot in a home invasion. And there was thephoto ofThomas Spruill, 25, wearing a Yankees cap. He was shot in a car. The dinner on Dec. 13 featured gospel music (video below) by Durham’s 100 Men In Black Male Chorus under the direction of Marlon E. West. This video outtake features testimonials from several parents during a song performed by Semaj Munford, 10, a member of the chorus. Since launching this website on Sept. 25, I've reported and shared stories about unsolved homicides and a former crack addict who turned her life around to become an inspiration to many. I've also begun the first of two final required classes at the Center for Documentary Studies at Duke. This next-to-last class is an independent study with an instructor who will guide me in pulling together the story for my short documentary film. So far, I've amassed about 10 hours of footage that includes interviews with parents of murdered children, support groups, vigils and community responses to homicides in Durham. Over the next several weeks, I'll work diligently to watch back and trim all of my raw footage down to about 90 minutes. I have some tough choices to make. The final cut will be a 10 to 12 minute film screened next year when I receive my certificate in video documentary arts from the Center for Documentary Studies at Duke. As I work on the film, I'll share short video excerpts here on the news blog of footage that may or may not make it in the final cut. In today's outtake, Mina Hampton recalls the day she crossed paths in a local fast food restaurant with the man who killed her son, Tommy. Her son was shot and killed in Durham on Feb. 19, 1994. Four men were arrested in the case; she said the shooter served about four years. "I want him to do well … But I do not want to talk with him," said Mrs. Hampton of her son’s killer, "and I do not care to see him." 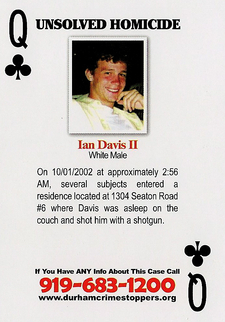 The homicide of Ian Davis is one of 52 playing cards featuring unsolved murders in the city and county of Durham.In the deck of playing cards fanned out in front of me at the Durham Police headquarters, the queen of clubs is Ian Davis II. He is smiling, his cheeks red from time in the sun. “UNSOLVED HOMICIDE,” the card says. His card is one of 52 in a deck featuring cold homicide cases in the city and county of Durham. 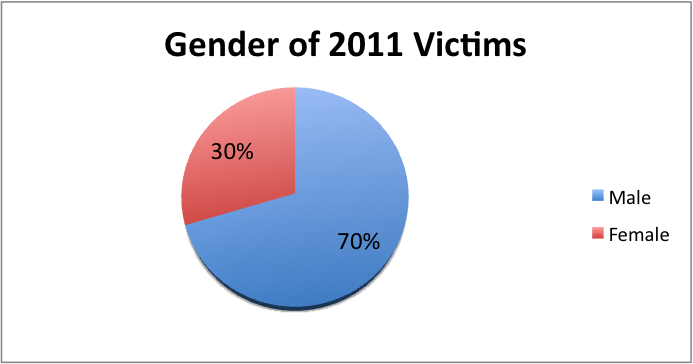 The deck includes 53 victims (the ace of spades is a double-homicide from 2009). The Durham Police Department created the cards last year and distributed 500 decks, most to local jails and prisons in hopes they will generate leads and arrests. It was Soucie’s idea to create the cold case playing cards, which were developed in collaboration with Durham CrimeStoppers. Ian Davis II was asleep on a couch in the Parkwood neighborhood in Durham on Oct. 1, 2002, when several men threw cinder blocks through a sliding glass door of the townhouse at 1304 Seaton Rd. They entered the living room, ordered Ian to the floor, and then shot him at close range with a shotgun, killing him. He was 18. No leads have come yet through the playing card highlighting Ian’s case. A $10,000 reward, posted by the family, is available through CrimeStoppers and expires next year. Since the murder nine years ago, Ian’s mother, Betty Davis, lives every day knowing her son will never walk through the front door. She said she wants closure but is willing to wait for a case with irrefutable evidence against the killer to avoid any acquittal in court, something she said she could not bear. She herself was a “prime example,” she said, of someone who believed, “this happens to other people.” Her son, the youngest of three children and graduate of Green Hope High School, was in the wrong place at the wrong time, she said. On Sept. 30, 2002, at about 10:15 p.m., Ian was watching TV at home but decided to leave and visit a friend. His mom begged him to stay home. It was too late, she told him. But he went anyway, telling her not to worry, that he was only going two blocks. Later, his mom said, Ian and a friend stopped by the townhouse on Seaton Road, where they cooked spaghetti, watched TV and fell asleep. At 2:56 a.m. Oct. 1, several men broke into the townhouse. Ms. Davis said a man whom her son did not know had started staying in the townhouse prior to the shooting and that the man may have been involved with drugs. “They think they broke in to get drugs,” she said. But the good memories come easy for her. Dancing with her son at her daughter’s wedding. Eating pizza with him on Friday nights. Shopping at the mall and chipping in for Nautica and Abercrombie & Fitch clothing that still hang in a closet at home, in the bedroom she has kept as Ian left it. This summer, Ms. Davis was diagnosed with lung cancer. When asked whether she feels a sense of urgency for closure in her son’s case, she said she has faith in a higher power, that those responsible for her son’s death will be held accountable. Anyone with information about the case is asked to call Detective Michele Soucie, (919) 560-4440, ext. 29337, or CrimeStoppers, (919) 683-1200. CrimeStoppers offers anonymity and cash rewards for information leading to the arrest and indictment of felony crime offenders.